There are all sorts of reasons why cats and kittens end up in the care of Cats Protection. Whether it’s because a cat is found as a stray or an owner’s circumstances change such as a relationship break up or an elderly owner goes into a care home. If a cat is given up by their owner it’s a heart-breaking time and often a difficult decision that is not taken lightly. 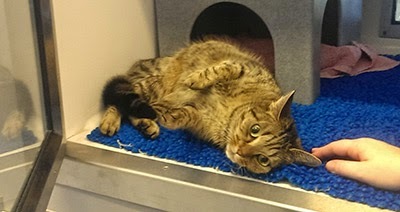 Dotty, who is currently in the National Cat Adoption Centre (NCAC), hasn’t had much luck. Her owners gave her up because she didn’t get on with their other cat. And before that, Dotty lived with an abusive owner who threw her out of a window. All this and she’s only around one year old. Understandably, although Dotty is friendly she’s quite nervous of people. Our carers at the adoption centre are doing a brilliant job of looking after her, but she really needs a home. We know she’ll make a lovely pet for a patient owner who can give her the time she needs to come out from her shell. If you’re interested in finding out more about Dotty, read her adoption profile on the NCAC website. There are always cats like Dotty in our care looking for a loving new home. You can find cats available for adoption in your local area using our Find-a-Cat search on our website. People are so cruel. Shes lovely.